As per Hindu Philosophy, it is said that having taken birth on this sacred Earth one should get discharged mainly from three types of Rinas (Debts) viz. Deva(Gods & Goddesses) Rina, Rishi(Gurus) Rina and Pitru(Ancestors) Rina. For the purpose of this article let us confine ourselves to the third one that is Pitru Rina. It is said and believed that one will get discharged from Pitru Rina by begetting a son (continuity of generation), by serving the Parents and also by performing Pitru Yagna (sacred rites to forefathers). Departed ancestors of your mother side and father side are the reason behind your existence on this earth plane today. Aadi Amavasai is the special New Moon Day to express your gratitude to your forefathers. Any Tarpanam ritual done on this day immensely satisfies your ancestors and as a result they bless you with abundant gifts and fortune. Performing Tarpanam rituals to your ancestors on this day will relieve you from negative Karma and gift you with prosperity and happiness in life. It will also bless your generation with good health, wealth and prosperity. Aadi Amavasai falls in July 23rd, 2017. Aadi Amavasai assumes greater importance because every year during this period the Sun moves towards the South and hence it is called the Dhakshinayana (Dhakshin: South; ayana: Travel). This is the first New Moon day of this period; hence it is the most powerful day to perform Tarpanam rituals for your ancestors. This story recurs several times in the Puranas. Rishi Agastya had a similar vision. Following this vision, Jaratkaru and Agastya get married and produce children. A male offspring was called Putra and a female offspring was called Putri because by their birth they saved their parents from the hell known as Put reserved for men and women who refuse to produce children. Pitrs are typically portrayed in art in male form because in the language of symbols, the male form is used to represent the soul while the female form is used to represent the flesh. 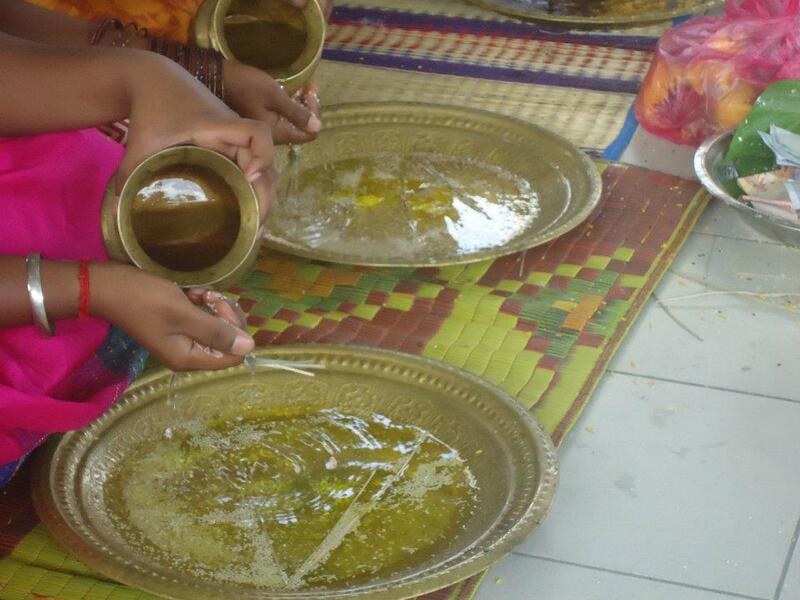 Traditional Hindus believe that every living man and woman is obliged to his ancestors, the Pitru, to reproduce. 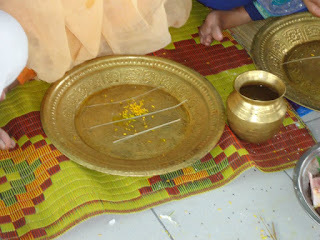 This called Pitru-rin or debt to the ancestors. This debt is repaid by producing children and enabling the dead to be reborn in the land of the living. During the Tharpanam rituals performed by Hindus, mashed rice balls mixed with sesamee seeds are offered to ‘toothless’ Pitrus with the promise that the Pitru-rin will be repaid. The rice balls represent food which is the raw material of the human body. Of course, like all things Hindu, there was always Upaay, or a way out, for childless couples. One could adopt a child. 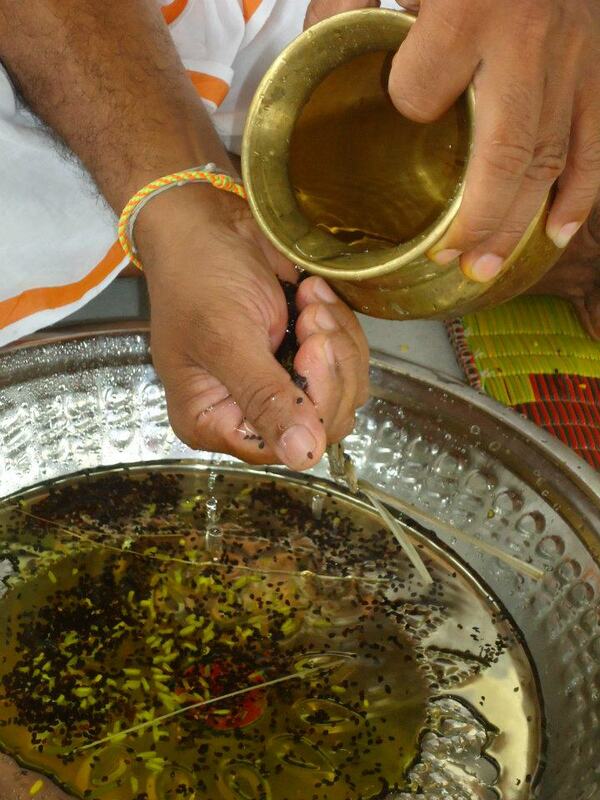 One could perform Tharpanam for oneself thereby liberating future generations from Pitru-rin on account of oneself. One could by prayers to God or a journey to a particular pilgrimage, or by acts of charity, break the karmic cycle and liberate oneself from all debts. In the Mahabharta when the prince Devavrata takes a vow never to marry, or father a child, the gods call him Bhisma, the one who took the terrible vow. What was this terrible vow? To understand this vow, one must appreciate the mythological framework of Pitru-rin. Out of love for his father who wanted to marry a fisherwoman, Devavrata took the vow of celibacy and thereby publicly declared he would not repay his Pitru-rin. By doing so, he doomed himself to an eternity in Put, with no hope of being reborn. Traditionally, Pitru-lokam is closest to Bhu-lokam (land of the living) when the sun is on its southerly course (from June to December). Perhaps Bhisma did not want to face his disapproving ancestors which is why he chose to die only in January, after Makara Sankranti, when the sun began its northerly course. Even today, around later winter and early spring there is a holy day called Bhisma-ashtami when in temples across India Tharpanam rituals are performed for Bheeshma – for the obedient son still stands toothless in Put, for the sake of his father. Hindus believe that the immortal soul is enclosed in three mortal bodies. The first body is the flesh, that we can touch and feel. The second body is the nervous energy that animates the flesh. The third body is the spirit body which cannot be seen. The spirit body is the container karmic debts and equities. Until this body is free of debts and equities, accumulated in past lives, the soul is obliged to return to the land of the living and experience circumstances resulting from past karma. When a person dies, the first and second body dies but the third body does not die. Through various funeral rituals, the spirit body is encouraged and assisted to make its journey out of Bhu-loka across the river Vaitarni to Pitru-lokam, the land of ancestors. While the journey to Pitru-lokam is through the crematorium, the journey back to Bhu-lokam is through the mother’s womb. While passing over the river Vaitarni, or while passing out of the mother’s womb, the spirit body loses all memory of previous lifetimes. Some souls are unable to make their journey from the land of living to the land of dead. As a result they do not turn into Pitru; they remain here as Pisasu or ghosts. Another word for Pisasu is Vetalam. Both Pisasu and Vetalam are visualized hanging upside down, usually from a Banyan tree in the crematorium, perhaps because they do not possess the human body and hence are not affected by the natural law of gravity. Since they are upside down, they have a topsy-turvy view of all things. They are known to torment the living by questioning them all that happens in Bhu-lokam. Thus, they are seen as the voice of conscience as well as the source of nightmares who have to be appeased or warded off. Many people believe that if a person or a house is tormented by ghosts, funeral rituals must be performed because in all probability no one performed these rites for them causing them to be trapped on the wrong side of Vaitarni, transforming them into angry poltergeists. PLEASE READ THESE POINTS CAREFULLY BEFORE DOING THE PITRU THARPANAM OR PITHRU THARPANAM. done for those who are alive. 3. If you know the gotram lineage of a person, say it just before you mention the relationship. not know the gotram of the person or you do not know what gotram is, just ignore this step. special mantras for this step. If you don't wear the sacred thread, ignore this step. 5. Can also do Pithru Tharpanam for more than 12 departed ancestors. Pithru Moksha temples or sacred spots. should be clean and calm. 6. Should not take bath (for the whole day) after completing Pithru Tharpanam / Poojas. 7. It is always good to offer foods and new clothes to those who are in really need of it. 8. Never do Pithru Tharpanam on your Janma Nakshatras. The blessings of your deceased ancestors, both maternal as well as paternal, are a major reason why you do or do not succeed in this life. If your ancestors are not resting peacefully, then they can cause much disruption and hardship in your life.